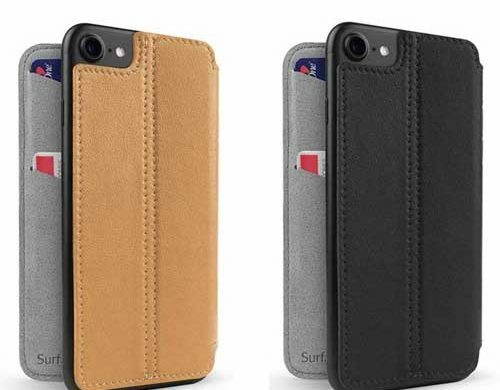 SurfacePad for iPhone X is a folio leather case for the iPhone X. It is available in brown, black or blue leather. My test unit is the brown leather model. 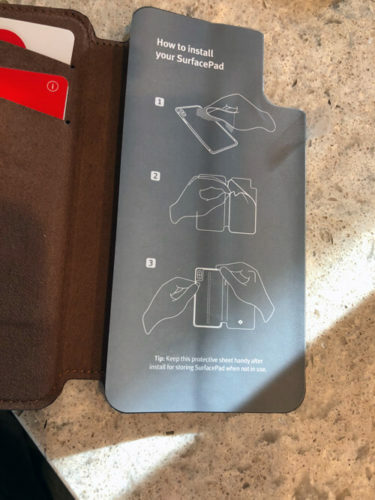 The case has two credit card slots in the inside front flap. Twelve South also carries the SurfacePad for for the iPhone 7, 7 plus, 8, 8 plus and all the recent iPad models. Instructions for the SurfacePad for iPhone X are complete and clear. The packaging stands out with the amount of quality design they put into it, especially the dummy iPhone X they used for demonstration. 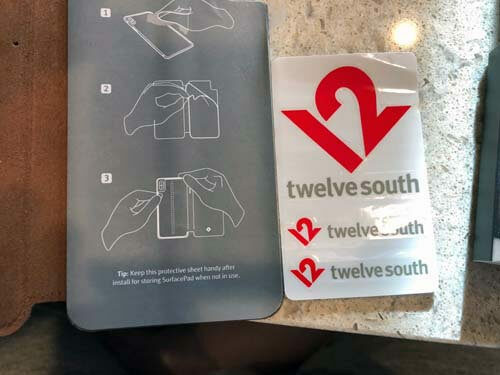 They even include Twelve South stickers. The first thing you notice when you open the package is the smell of leather. The next thing you notice is that how thin and light, but sturdy the case it. Lastly you will notice that this case installs a lot differently then other cases. The inside back flap of the case has a sticky surface once you peel off the reusable film protector. 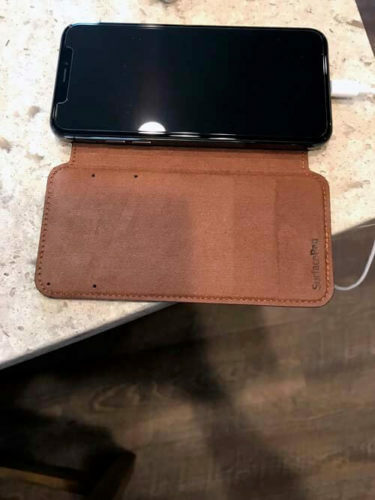 The back of the iPhone X sticks to this surface and that is how it attaches to the case. It did take me a few times to get the placement straight while keeping the camera area clear. Once I got the position right, the phone stuck to the case with no issues. Taking the phone off the sticky surface a few times didn’t seem to make the surface less sticky. It will be interesting to see how well the stickiness holds up over time. 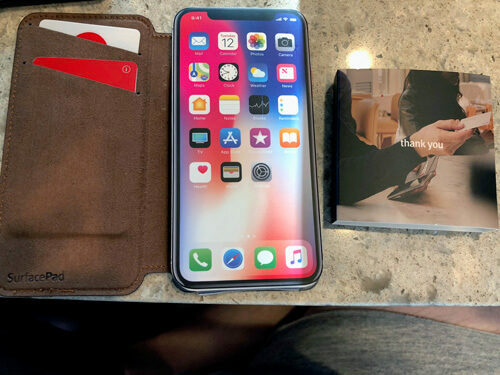 The SurfacePad for iPhone X looks incredible with the iPhone X inside of it. I have always avoided folio cases because I was worried about having to open the case every time I looked at my phone. Its still something you need to do, but the flap is very light and quick to open. I was also worried that the case would not fit in my phone car mount. With the flap fully open and folded back, it fits and works fine. The volume buttons also are on the outside of the case, so I am able to change the volume easily with the flap closed. I don’t plan to put my credit cards in the case personally, but it fits two cards with no issue. So far, the SurfacePad for iPhone X passes the looks, use and function test. The features I listed already are all well and good, but it gets better. By far my favorite feature is the auto lock when you close the case. 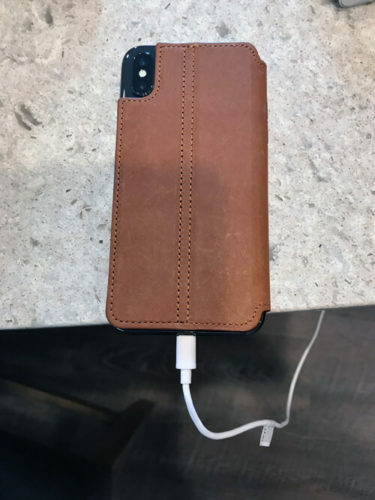 The more expensive Apple Folio case for the iPhone X does this as well. It is actually fun to do and works every time. My next favorite feature is the built in stand. It easily folds out into stand mode and is perfect for watching videos. I have used the case for a few days and I think Im going to leave this one on. The brown leather with the shiny black phone looks classy. 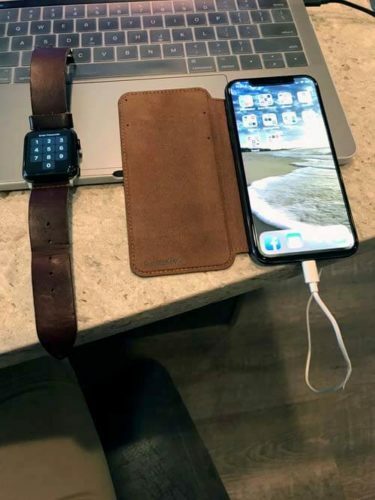 So classy I decided to put my brown leather Apple Watch band on to match. The leather looks and feels strong and should hold up over time. The only question would be how long the sticky surface lasts. If that doesn’t last, the phone won’t stay in the case which would make it useless. MyMac Review Rating is 9 out of 10. Twelve South really knows how to make an Apple devices look like a work of art. The case is gorgeous, well built and minimalistic. It looks like it will protect the phone with no problem. The one unknown is how long the sticky surface that holds the phone in place will last.